Belle Isle is the little island in the Detroit River, which separates Detroit and Windsor, Ontario. It’s filled with pretty spots, one of which is the Conservatory and its fish pond. I disagree with Donald Trump about pretty much everything, but I think he’s right about one thing, at least: many American airports are pretty crappy. Describing them as “Third World” in quality may be unfairly insulting to our friends in the Third World. You realize this when you leave the States. Consider the Calgary airport, for example. 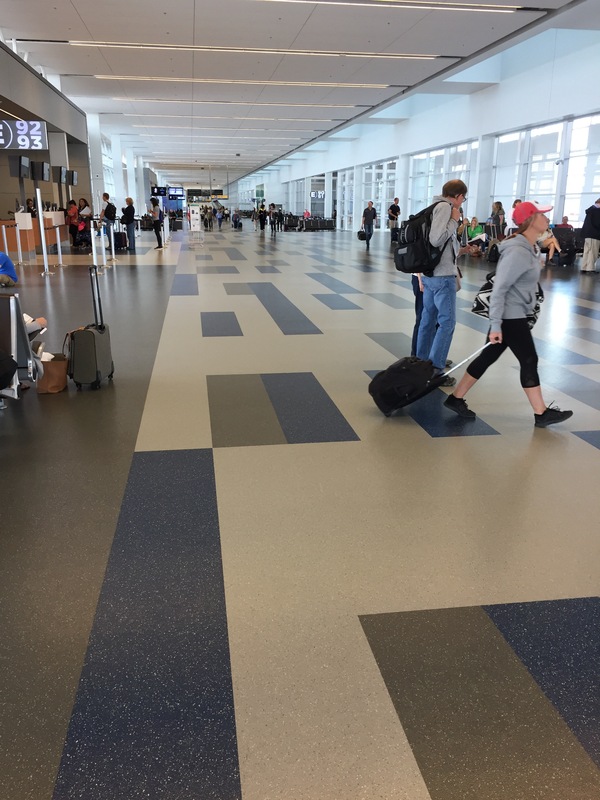 The E concourse looks newly built, and is spotlessly clean and spacious. Compare it to, say, some of the cramped, beat-up, and overcrowded terminals at, say, LaGuardia, and you get the President’s point. It’s sn embarrassing comparison. We should be able to match our neighbors to the north in the airport department. The duty-free shop at the Calgary International Airport features booze and the other items you awaits find in a duty-free shop . . . and maple syrup. Lots of maple syrup. Shelves full, and in decorative maple leaf bottles, too. 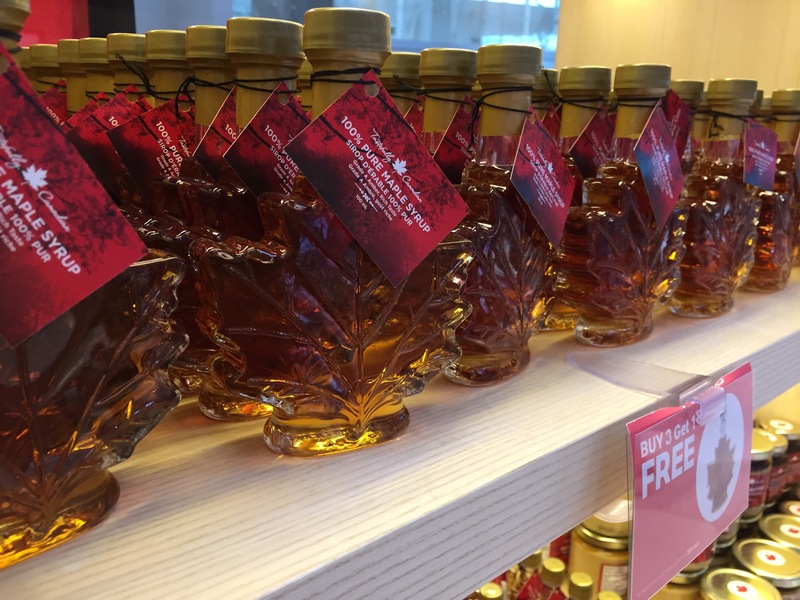 So much maple syrup, in fact, that they’re actually running a buy 3, get 1 free promotion. So if you need four decorative bottles of maple syrup, perhaps because you want to clebrate Canada’s 150th birthday as you eat your pancakes, and don’t want to pay any duty on it, I know where you can go. Or, you can pick up some Mrs. Butterworth’s in your local supermarket. 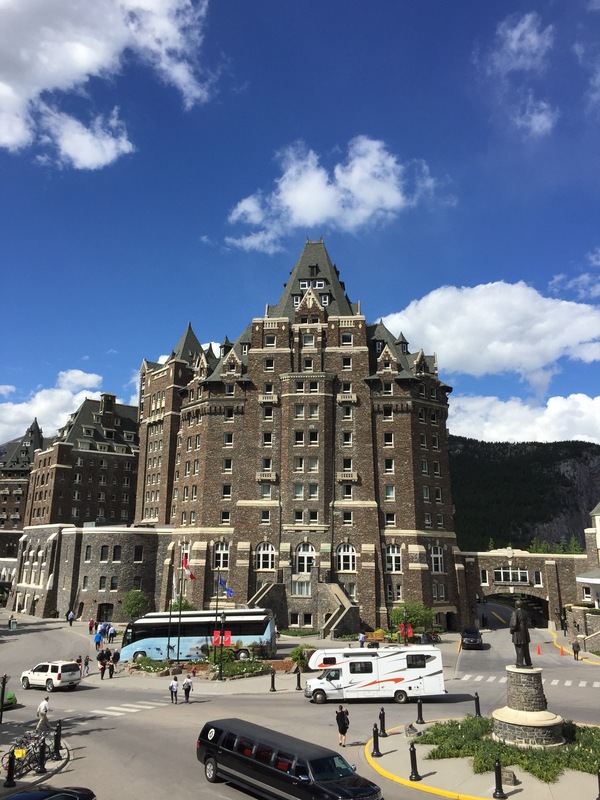 We’ve spent the last few days at the Fairmont Banff Springs, a colossal old-line hotel that sits on a bluff above the Bow River. It’s one of those sprawling complexes that is a bit of a maze — and at the same time full of surprises as you wander around trying to get your bearings. One day I was trying to figure out my route to the conference center for a meeting when I ended up in a room where a woman in medieval garb plucked away at a full-sized harp while two guys played pool. When I apparently looked quite lost, she stopped her playing and helped to get me back on track. And there appear to be different restaurants, shops and bars on every level, as well as meetings rooms galore. We’ve enjoyed our stay in this beautiful part of the world. 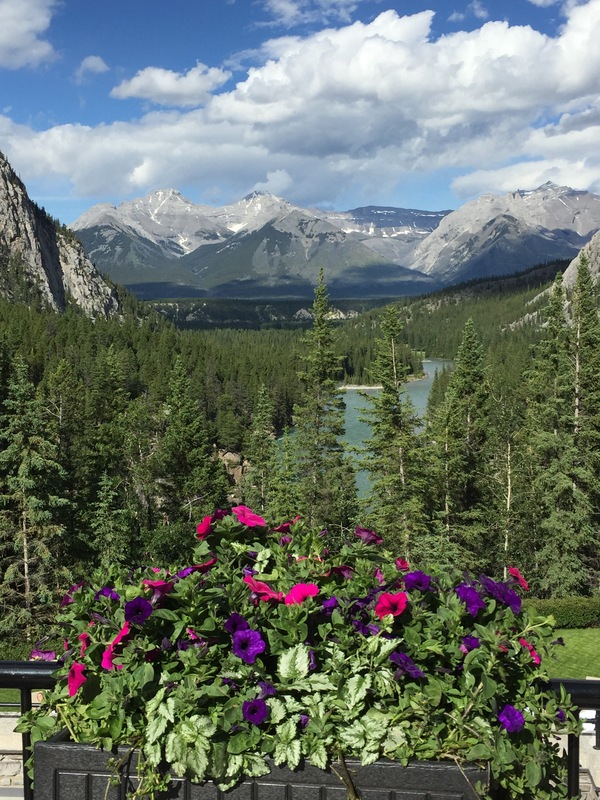 How could you not like a hotel with a patio that offers a jaw-dropping view like the one below? 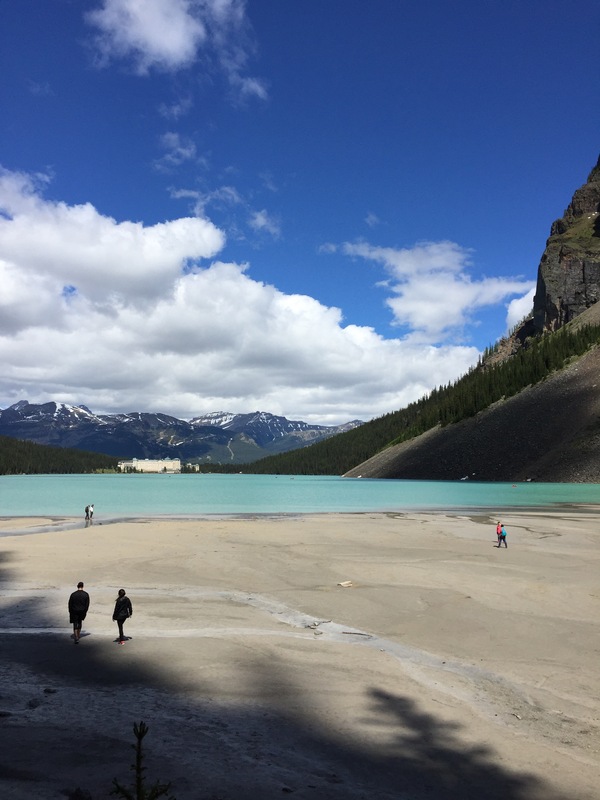 Yesterday we drove to Lake Louise, which is about an hour away from Banff via Canada highway 1, the Trans-Canada highway. 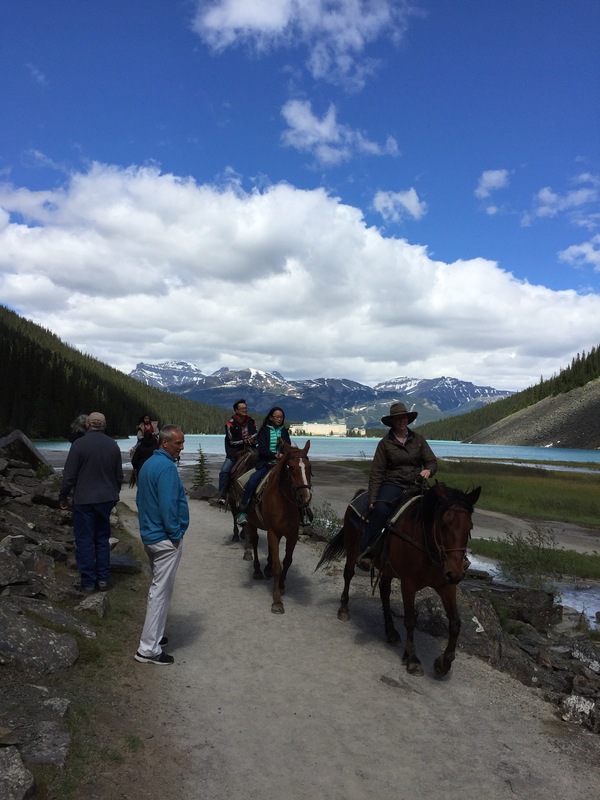 It’s a pleasant ride through more of the towering peaks of the Canadian Rockies. 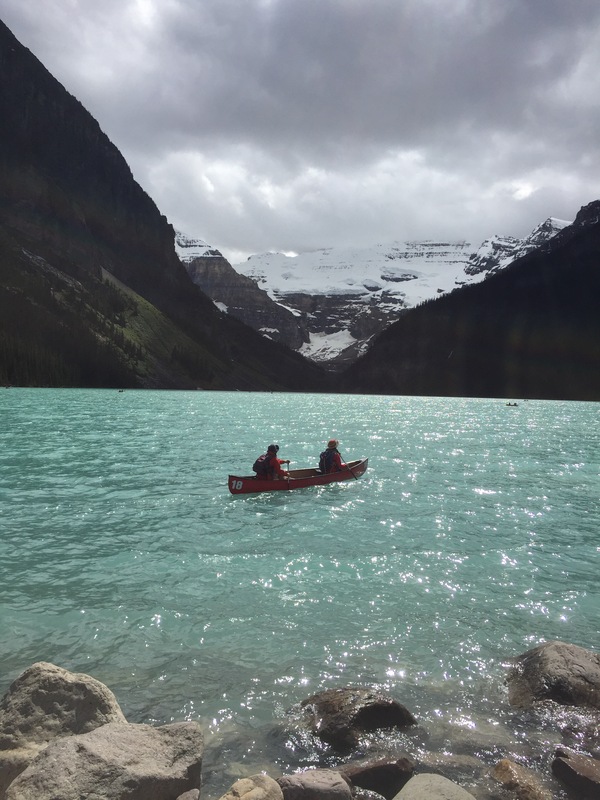 One of the locals told us that Lake Louise is the most photographed place in Canada. If that bit of local lore is true, it’s not hard to see why. 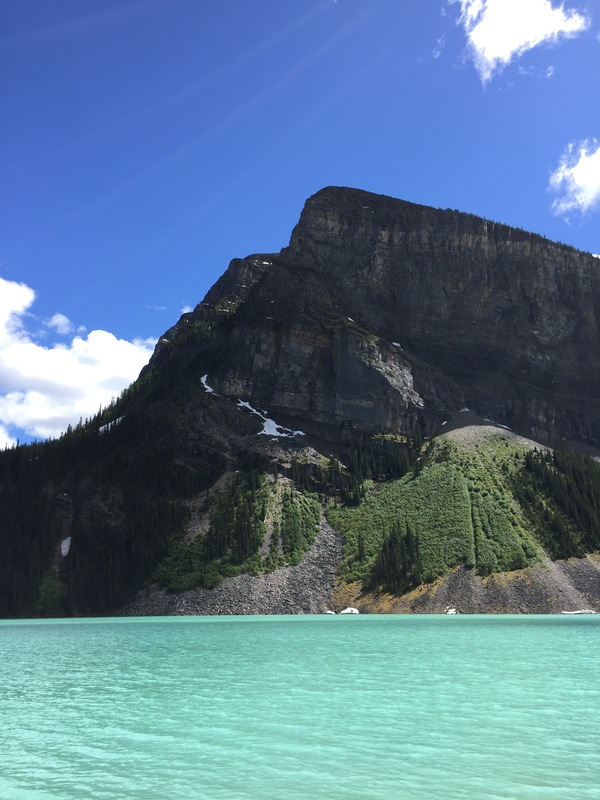 The water in the lake is a brilliant turquoise color, like you might find in the Caribbean, and the lake is surrounded by craggy mountains with glaciers at the far end. It’s a fantastic, beautiful place. We followed a walking path from the grounds of the Fairmont, which anchors one end of the lake, down toward the glaciers. The trail runs for about a mile and a half along the rim of the lake. We shared the path with lots of other gawkers and some trail riders. 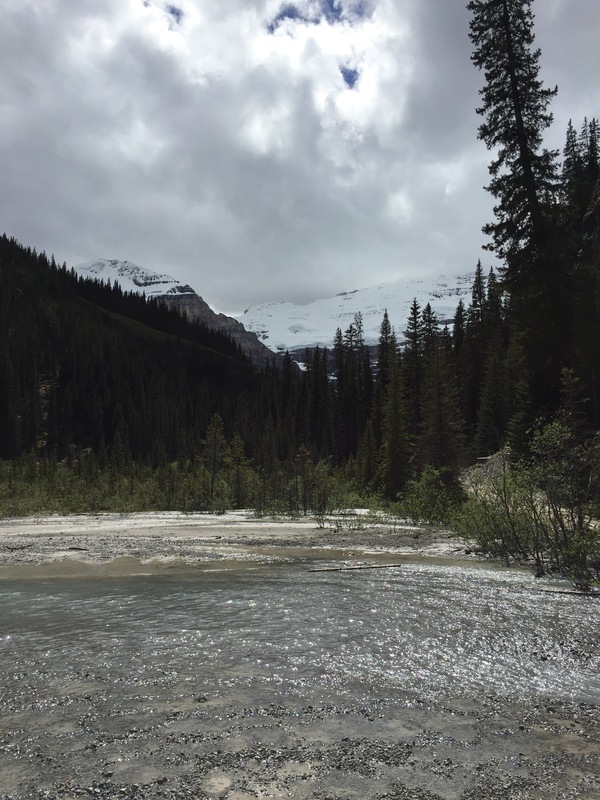 There is still snow melt running into the lake, and the water is icy cold. At the far end, there is a beach and then the lake becomes a kind of marsh, with the glaciers hovering on the mountaintops far overhead. I’m not ashamed to say that I took my share of pictures of this wondrous place. I’ve helped to add even more credibility to that bit of local lore about Canada’s most photographed spot.